The Dragon God's soul "radiates a strong power". A 100 foot tall dragon with a massive wingspan which fills the entire chamber. If he perceives the player's presence he will attempt to smash them with his spiked fists. Miraculously the dragon bones at the base of the mine exuded ore imbued with the power of flame, what the Ancient Burrowers called dragonstone. In order to appease these bones of dragons, the Ancient Burrowers carefully crafted a Temple where they could both worship at and contain their Dragon God, a large dragon skeleton in molten lava, should it ever resurrect. As an added precaution, the Burrowers constructed two large magically-enchanted harpoon guns on either side of the molten pit and forged the Dragon Bone Smasher, a weapon capable of slaying dragons by crushing their bones. The Deep Fog eventually reached the depths of the Stonefang mine and when it touched the molten dragon bones it tapped into the power inherent in the colossal flames to resurrect the Dragon God as a Demon. The body is humanoid in shape almost like a giant man who grew scales, sprouted wings/ a tail, and had his head transformed into a dragon's. In the course of the game, there is actually the possibility to encounter two separate Dragon Gods. There is the one all must face at the bottom of Stonefang Tunnel, but there is also one the player encounters if the Vanguard is defeated at the end of the Journey to the Nexus. This Dragon God is slightly thinner and sits on a mountain top near a volcano spewing lava. 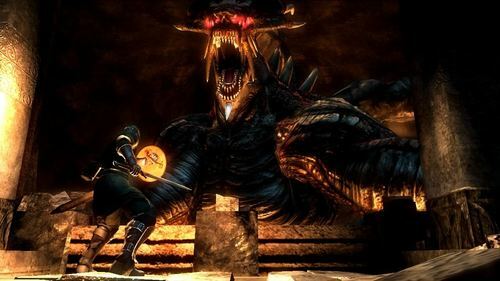 The chamber the player arrives in before facing the tutorial Dragon God has architecture and markings which do not resemble the architecture of Stonefang Tunnel. The encounter ends with the Dragon God killing the player in one punch so that their spirit can be summoned to the Nexus. This may be the same Dragon God which can be seen carrying the dead body and attacking the fluted armor knight in the main menu title trailer. Proof that there are two separate Dragon Gods can be found in the light ending credits. Each boss Demon is depicted in concept art and the Dragon God concept art features two different dragons. We know this does not represent the Red and Blue Dragon because the dragons depicted have holes in their wings (like the Stonefang Dragon God) and the Boletarian Dragons are already represented in King Allant's concept art. As the Archdemon was worshipped as a God, the countersign of the Dragon Demon's Soul is God's Wrath, one of the greatest miracles, and represents God's power against Dragon God's tremendous malice. The other two spells crafted from the Archdemon's soul (fireball and firestorm) are powerful fire spells, representing the colossal power of the flames in the Dragon God's chamber. Generates a strong blast of force around the caster. Dragon bone fossilized by lava. Enhances straight swords, axes, hammers, and so on. A bladeless, thick mass of iron used for smashing. According to the ancestors of Stonefang's excavators, it's said this weapon was created to face dragons, and is imbued with magic to protect the wielder from fire. Deep inside Stonefang mine is an ancient dragon burial ground. The bones of the dragons exude ore. There is a temple beyond here, below the ground. It is a work of art, molded by the ancient burrowers to appease the bones of dragons. As a precaution, a broad sword which can crush bone and slay dragon is stored in the temple. Truth told, it is the laughing stock of many a swordsmith. They say it's as blunt as a bludgeon. A dull blade made to slay a dragon… Curious, is it not?